Casa del Cientifico, beautiful colonial building with lofty ceilings and lots of marble where the nation’s president lived at the turn of the century. Built in 1919 and recently renovated, it is sumptuously adorned with rococo furnishings. Neoclassical interior courtyard and balcony overlooking the Prado. Huge air-conditioned rooms, 5 with private bath, 6 with shared bath and one suite. Luxurious, intimate, wood-panelled dining room and lounge in classic style. Weekend cabaret on the roof terrace. Very pleasant atmosphere. Friendly staff. 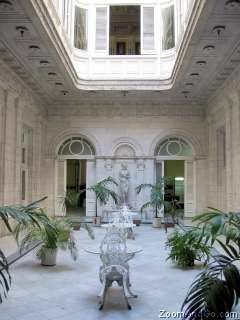 This hotel, located in the centre of Havana, is a real gem. 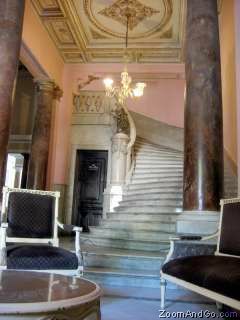 Once the residence of Cuba’s second president, José Miguel Gómez -- known as El Tiburón (The Shark) -- this charming old house near the Museo de Bellas Artes has a grandiose marble stairway and a tile-and-mahogany-lined dining room. Rooms come in a variety of prices and configurations (with bath and without), but the best is the top-floor suite for two Casa del Cientifico is not contracted by our company and we therefore can not reserve this hotel. We suggest Hotel Lincoln or Park View instead in the area. This hotel is NOT available, please try other hotels in the area such as: Lincoln, Caribbean and Lido hotels. Book the most beautiful Hotels in Cuba and enjoy their charming architecture. Email Nestor for information. 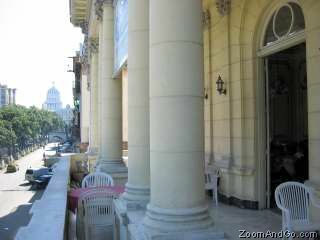 For long term stays in Havana try extendedstaycuba.com. By the centric Avenue of Boyeros and near the Revolution Square and the National Theater. No reviews for Casa del Cientifico yet.